Your busy schedule shouldn’t get in the way of the look you want. We try our best to work around your schedule. Although we prefer that you make appointments ahead of time, we happily accept walk in clients. Eyebrow threading is one of the more popular services we provide in our Yorba Linda salon. It’s a very good way to shape eyebrows and is a great technique for trouble brows. When seen for the first time, the process may look a bit unorthodox. A threading specialist uses a cotton thread to pull unwanted hair in a twisting motion, trapping the hair in a miniature lasso, and then lifting the hairs right out of the follicle. Threading removes the entire hair follicle from the root, achieving hair free results for weeks. Over time, frequent threading can lessen hair growth. The thread is twisted along a straight line, which makes for a quick and precise shape. 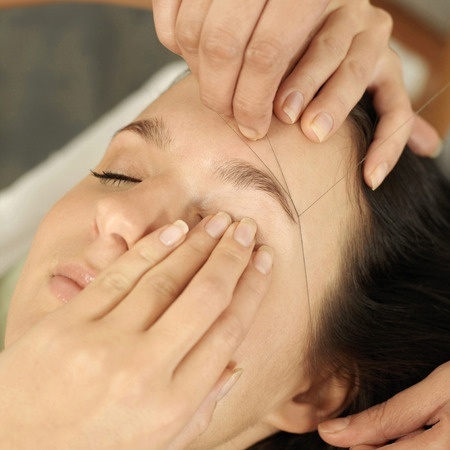 Threading is becoming extremely popular for many reasons. First, it is a chemical free process for people who have allergies. It is gentle to the skin for Retin-A users and people with rosacea. You may feel uncomfortable with your first experience; however, you will quickly get acclimated to the procedure. How Long Is An Eyebrow Threading Procedure? Although you would think threading with a string could be a time consuming process, it is actually very fast. Generally, an eyebrow threading session takes less than 10 minutes, upper and lower lips take less than 5 minutes, and a full face can take 20-30 minutes. Threading is a true art that has been passed down through the generations, and is not easy to learn. Our specialists possess that quality and are among the most experienced in Yorba Linda.